Cutest Kids' Feet Contest Coming Soon! 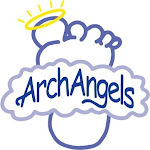 We've been busy at Arch Angels® headquarters. One thing we've had in the works for a while is finally coming alive. We wanted to share it with you even though it's not quite live yet. Here at Arch Angels® we are so absolutely in love with kids’ feet, we want to find the cutest kids’ feet out there. And we want to share them with the world. Sure, you’ve spent hours taking photos of your kids’ adorable faces, but what about those feet? Are they splashing in the puddles? Are they covered with mud? Do they have painted toenails and glitter? Take a minute, grab your digital camera, and capture your child’s feet doing what they do best – living life to the fullest! The winning photo will receive $500 in cash plus a lifetime supply of Arch Angels® comfort insoles. That’s to make sure those feet keep doing the things they love, with the right amount of comfort and support along the way. Stay tuned for the official launch - and in the meantime, start taking those cute pics!